Isaiah Thomas is making it look like Jimmer Fredette should have never been drafted ahead of him or in the first round at all for that matter. 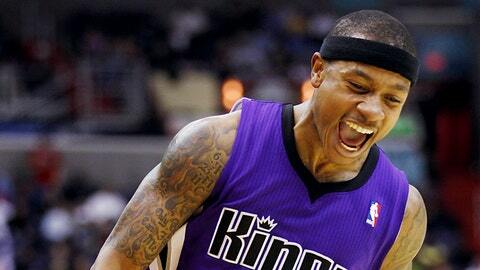 Thomas, picked by the Kings in the second round in 2011, is doing the NBA as dirty as a 5-foot-10 guard possibly can. His block on Bernard James, 6-foot-10, Monday night was an instant block-of-the-year candidate. Thomas is averaging 18.2 points and 5.3 assists, shooting 45 percent from the field in the process. Since Sacramento traded its former starting guard Greivis Vasquez to Toronto, there’s no reason why Thomas won’t continue to get the burn a budding star should be getting. It might be time to lock him up with an extension and find somewhere to put Fredette in the process.